This little sheet cake was made for a baby shower for my sweet sister-in-law Amy! She’s a teacher and her fellow teachers were giving her a shower at the school! 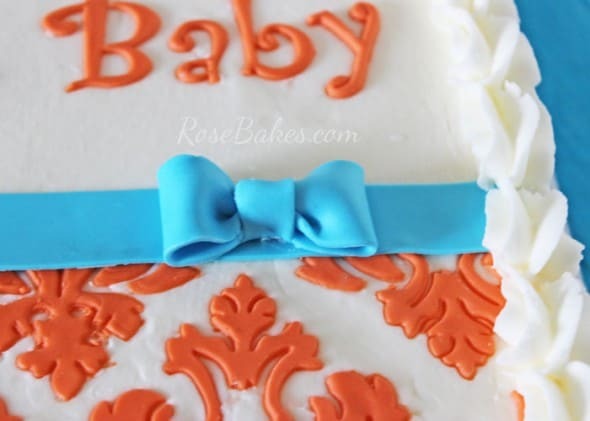 The cake was done last January – a few months before she had Caroline Lily-Belle, but she was already decorating her nursery with orange and turquoise. In fact, the damask pattern on this cake almost perfectly matched the curtains hanging in Caroline’s room. 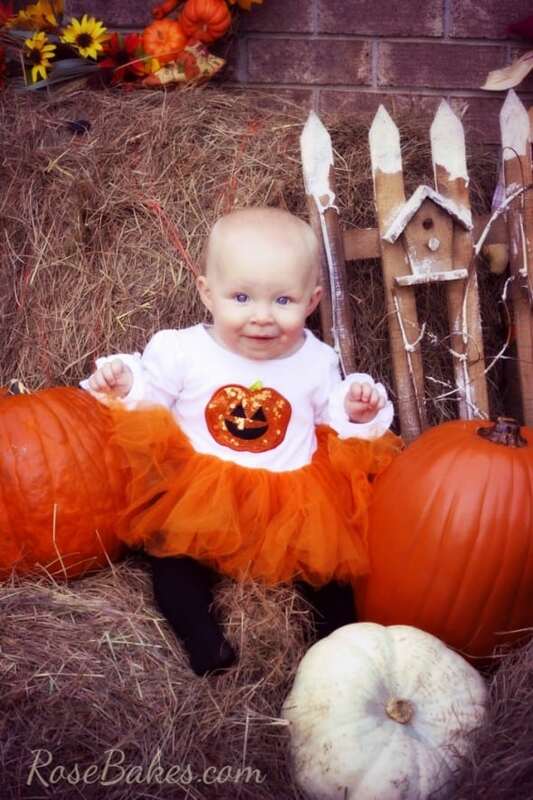 I took this picture of Caroline at our church Fall Festival a few months ago … she’s a doll right? 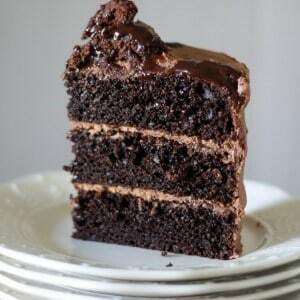 Anyway – I didn’t get lots of pictures of the cake… if I remember right, I was rushing out the door that day to get it to the school on time, but I’ll tell you what I can about it. It was a 9×13 sheet cake – and the flavor was strawberry – Amy’s favorite! It was covered with cream cheese buttercream, then decorated with homemade marshmallow fondant. For the pattern on top, I used a Marvelous Mold Damask Onlay. 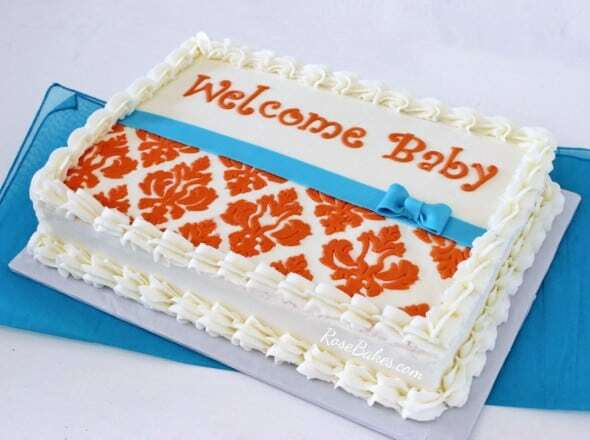 I still haven’t mastered using the onlays (I also used it on this Tiffany Blue & Black Damask Baby Shower Cake), but man on man, if you can pull it off, the pattern is so beautiful and the mold saves about a zillion hours of work! 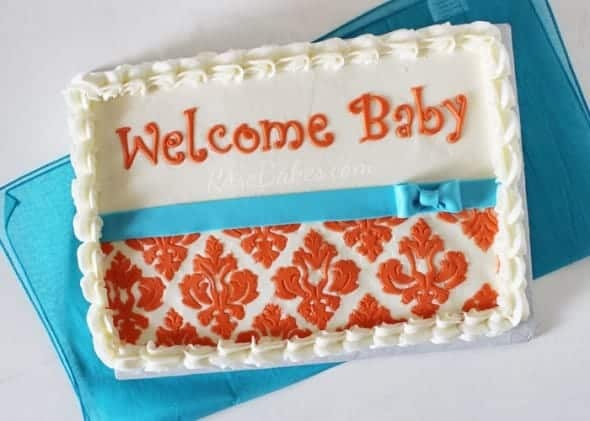 For the “Welcome Baby”, I used my favorite Funky Alphabet Tappit Letters (of course) and you can see how to use Tappit Cutters in my tutorial here. I used my FMM Ribbon cutter to cut cut the ribbon for the top, then this super-fantastic JEM bow cutter for the tiny cute bow! When I discovered those bow cutters I quickly became totally addicted to them! I bought all the sizes!! haha! I used a little dot of sugar glue to hold it together. To pipe the borders, I used the Ateco 825 tip from this Large Tube Set. OH – and to color the fondant I used Americolor Electric Blue and Americolor Orange Gel Colors. They’re my fave! So, that’s all! Do you have any questions about this Bull Riding Cowboy Cake? Leave me a comment and I’ll answer if I can!